The 2018 Yeppoon Tropical Pinefest is not to be missed! Save the fuss – catch the bus (to avoid the pirates) to this years Yeppoon Lions Pinefest. 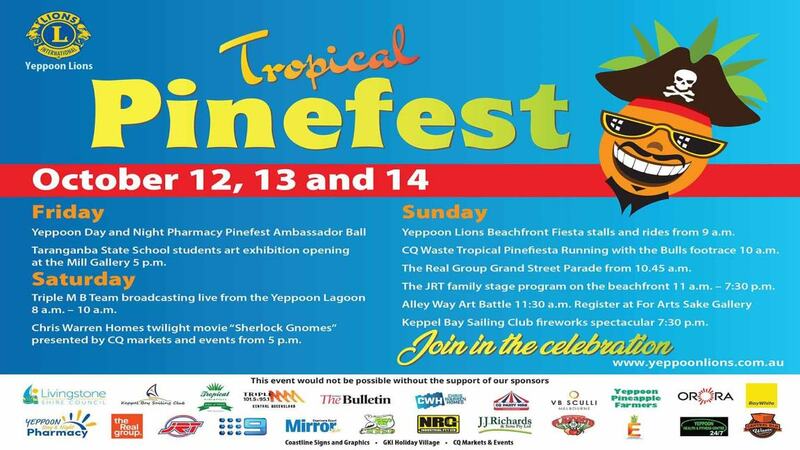 Central Queensland will be celebrating the Yeppoon Lions’ Tropical Pinefest in Yeppoon from Friday the 12th of October, to Sunday the 14th of October 2018. Pinefest bus times are the standard bus times. Please note the Capricorn Coast route 20 service is the only service operating on Sunday October 14. IT’S BACK! The running of the bulls was so successful last year that the event is on again! The parade will be preceded by a foot race and the running with the bulls, which will provide families with a whole new level of entertainment. For more information, visit the Yeppoon Lions Pinefest Facebook page.